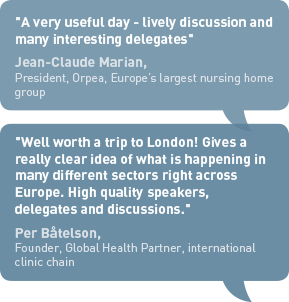 How healthcare is changing in Europe - and why you should join us! This event reaches an elite. 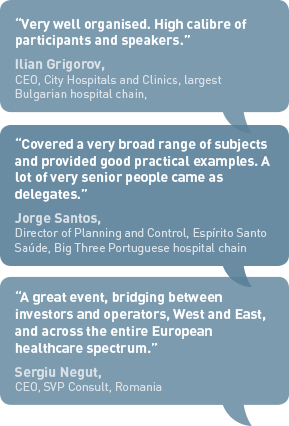 It is the only pan-European conference dedicated to the private healthcare sector. 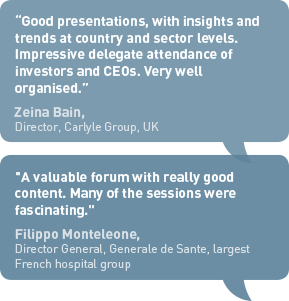 Last year we had over 200 delegates, including many investors as well as CEOs of big hospital and nursing home groups. They came to pinpoint opportunities, to understand how markets are changing and to explore new business models. This really is a unique opportunity to get a clear picture of how private healthcare services is growing across Europe. Martin gives a detailed overview of transactions and volumes in Europe over the last year, focusing specifically on valuations. With stock market multiples at near record levels, he asks whether we are we about to see the return of a bull market in mergers and acquisitions. How to improve care and drive productivity in health providers. What works today? What will work in five years time? Minds & Machines: healthcare and the industrial internet - Jean-Michel will explain what the industrial internet means to healthcare and how this will help boost operator productivity. 11.00-11.30 How next generation genetic sequencing will impact private and public healthcare Dr. Thomas Grünfeld M.D., Senior adviser to the Norwegian clinical genetics analysis platform. Next generation genetic sequencing (NGS) will have a profound effect on the healthcare landscape. Within the foreseeable future, NGS will be cost-effectively and readily available to large patient groups - we can even envisage most citizens having their exome sequenced in post natal screening programmes. Grünfeld, a former McKinsey consultant, M.D. and molecular geneticist, is better placed than most to analyse its impact, as Norway is one of few countries which is piloting a nationwide programme to deploy NGS technologies to widespread clinical practice. What will such platforms look like, who will do the work and what impact will it have? Thomas looks specifically at the impact on private diagnostic labs and healthcare providers. 11.30-12.30 Elderly Care - Internationalisation and Innovation In conversation with Henrik Borelius, CEO, Attendo, the Nordic’s largest nursing home player, and Yann Coléou, CEO, Korian, the leading player in Germany, France and Italy. What are the benefits and the limits of internationalisation? How do they see elderly care provision changing? 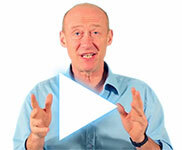 How do you best instill a culture which encourages high quality care? Terveystalo with 18 hospitals and 150 outlets is the largest private healthcare operator in Finland. Yrjo, who joined as CEO in 2010, has an FMCG background (Procter & Gamble) and has doubled profits in four years through culture change and powerful new IT. He looks at how Terveystalo is building new services, based on sophisticated patient record systems, aimed at creating life-long loyalty from groups as varied as families, the elderly and the active fit. How does the web fit in to this? BMI with sales of £851m is the UK’s largest private hospital group. Stephen looks at how it is building websites aimed at specific conditions backed by a sophisticated call centre staffed by medical specialists. This enables BMI to redefine its relationship with physicians by becoming a demand generator, as well as the data to drive the business forward. TripAdvisor-style sites are set to change the structure and behaviour of private healthcare provision. They are growing fast in the Nordic region, Germany and East Europe. German healthcare consumers say that such sites will have an 8.1 out of 10 impact on their choice of services by 2014. The largest is Jameda with 600,000 written reviews and traffic rising at over 60% year-on-year. Philipp looks at how these sites are changing behaviour and the implications this has for operators. Who better than Cerba to look at the opportunities now opening up? As well as routine labs, the big Franco-Benelux player also runs one of the largest European specialty and central lab operations. Jérôme looks at how Cerba is building a brand in routine testing, embracing innovation tests in its reference operation and developing next generation biomarkers in its central lab. Dimitris looks at how Euromedic, the European diagnostic group has re-engineered its business and at the impact this has had on performance. Here we look at the opportunities and hazards of investing in this fascinating region. Baring Vostok is invested in EMC, Russia’s largest private hospital group, as well as in Russian primary care provider Family Doctor. He will look at the prospects for investors in Russia. Joe has 17 years experience as CFO of Medicover, the only Pan-East European provider of comprehensive medical services from insurance to hospitals, ambulatory centres and diagnostics. Medicover is active across Poland, Germany, Romania, Ukraine, Turkey, Belarus, the Balkans and other ex-Soviet republics. INSEAD educated, Sergiu is the former Deputy CEO of Regina Maria, the big Romanian hospital and clinic chain and has also worked for Amgen. Over the last two years, among other initiatives, Sergiu has built a consultancy business advising healthcare services and investment companies on opportunities in Romania. A new addition to this year’s event, this is a unique opportunity to meet a range of CEOs from healthcare operators across Europe, and to discuss with them their markets and business models. Delegates are free to move from table to table, meeting directors from different operators who have agreed to explain their strategy and approach. We anticipate there being at least 20 groups, covering markets from Portugal to Bulgaria and from Finland to Turkey. We have sub-titled this event ‘The Return of the Bull Market’. As public budgets are squeezed, so patients in many countries are turning to the private sector. Meanwhile, we are seeing a wave of privatisation and functional outsourcing. This year we also look at the real impact of the web on patient behaviour and at how powerful IT platforms are capturing new markets. Most healthcare conferences feature poor speakers who overrun on time and do not address key issues. The worst feature interminable presentations from big pharma and politicians mouthing inanities. Often they allow sponsors to determine content. Academic conferences are often removed from the real world.